Plum Blossom Continent is located in Town Fengqiao which is the biggest town in Nanhu District. Town Fengqiao is the hometown of many famous people with a long history. Town Fengqiao is well known for honey peaches and folk arts such as Black Pottery, Bamboo Carving, and Ocarina. 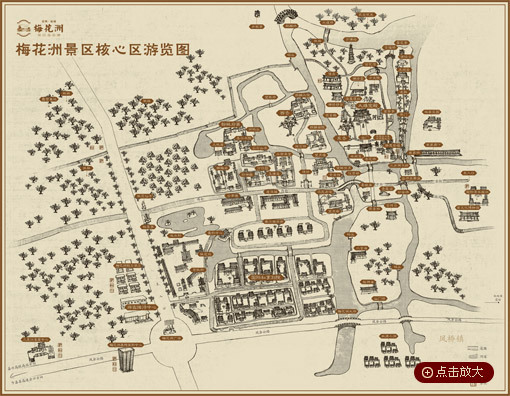 The profound cultural background of Fengqiao Town builds a complementary relationship with Jiaxing's economy and culture. Plum Blossom Continent in Fengqiao Town is divided into five pieces with creeks running through them. It looks like a plum blossom and this is how its name originated. Each of the five pieces is surrounded by water while connected by bridges. Thanks to the bridges built in different times in the past, the distinguished feature of bridges concentration in Plum Blossom Continent has been produced. The planning area for Plum Blossom Continent Scenic Region is 12,000 mu. The eight sights, which mean Ironwood, Bodhi Tree, Jian Spring, Four Buddha Stone, Plum Blossom Continent, Heliotrope Pool, Fragrant Flower Bridge and Mount White Cloud, will be reconstructed as the original look. Majiabang cultural site, Rock Buddha temple of Southern Dynasty, Baiera with ages, Three Step Two PiecesBridge and Old Residence of Ming and Qing Dynasty, all these ancient relics of civilization bring Town Fengqiao unique cultural sites and lead to enormous potential of tourism development. The Bhavana Center is creatively initiated in this district. Its spirit of pursuing fitness, vitality and health will form a regional Bhavana Center.